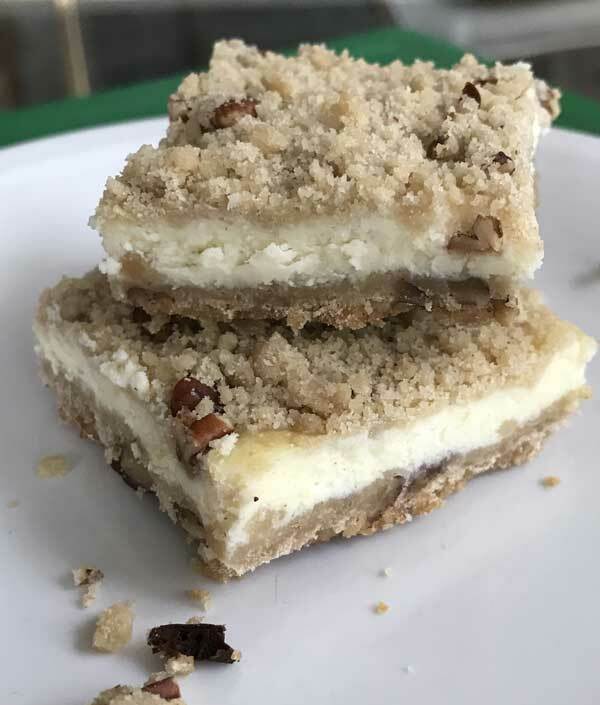 This small batch Cheesecake Bars recipe is from one of my grandmother’s old organizations, The Houston Junior Forum. I am not exactly sure when she was a member – probably very long ago. And while I think she probably let her membership lapse, she kept up with the cookbooks. This recipe is based on one in a book called “Scrumptious”….which, by the way, is word I don’t usually say out loud. I do like the cookbook, though. These were so good that I added the metric. A little bit, at least. Update: I’ve made these several times since posting and they are super reliable and very good. Feel free to double! One thing you should know is the dough is very, very, dry. It will feel dry when you mix it and it will look dry when you take it out after the first round of baking. But don’t worry. Once the cheese is poured on and the cookies have baked and set, the crust absorbs some moisture and the texture is quite nice. Preheat oven to 350 degrees F (180 C). Grease an 8 inch square metal pan or line with non-stick foil. Beat butter, brown sugar and salt together until creamy. Add flour and stir until it is fully blended – batter will be thick and crumbly. Stir in the nuts. Measure out about 1 cup and set aside. Press remainder into bottom of pan. Bake crust for 15 minutes. Beat cream cheese and granulated sugar until creamy. Beat in lemon juice and vanilla, then add egg and milk and beat just until smooth. Pour cheese mixture over baked crust. Sprinkle reserved crumb topping over top. Return to oven and bake for 25 minutes. Let cool on a wire rack, then transfer to refrigerator and chill for at least 2 hours or until ready to serve. I made these into mini cheesecakes and topped with fruit just before serving. Yummy and pretty!! Cool! Thanks for the review, Courtney! I made these today, but omitted the nuts and added caramel syrup instead of lemon juice….OMG they are great!!! Anna, do you think a flax egg would work? Thanks! Thank you, i’ve try those and they are great. One big thank you from Croatia! Carol, thanks for trying the recipe! I think I liked it for the same reasons you did. It was pretty straightforward and made with ingredients on hand. Yum! Or, Scrumptious! I made these last night – I mean, I had all the ingredients on hand, so how could I not? They really are quite easy, and very very good. I love having the same batter for the crust and then also crumbled on top. The filling is nice and cheesy with just a hint of lemon, and plenty sweet. Love ’em, thanks, Anna! Looks so yummy and sounds really easy! VeggieGirl, maybe if I start saying “Scrumptious!” over and over I’ll get used to it. BB, believe it or not, these are fairly portable. If you chill them long enough, they really firm up. I love easy recipes like this! Too bad cheesecake is not the best dessert to transport during the summer months but they sure are great to eat! 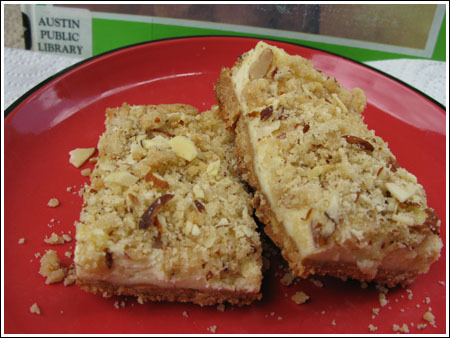 I love the idea of crumb topping on the bars! Sounds like a fun evening planned!! I use the word “scrumptious” out loud, all the time, haha :0) Perfect word for those bars, for sure!